Both mom and baby are really tired. Being born is a hard job for all involved, especially when you have to be in the hospital for 10 days prior to the actual birth. They are both exhausted. Addison is in the NICU, Aimee still is in the hospital. In some respects it makes it easier for her to be that close for feeding purposes, but it is so hard to rest there. She just gets to sleep and the janitor comes in or time for vitals , or friends calling in, excited about the baby, wanting to know when they can come see her. Having a complicated birth is just that, complicated. 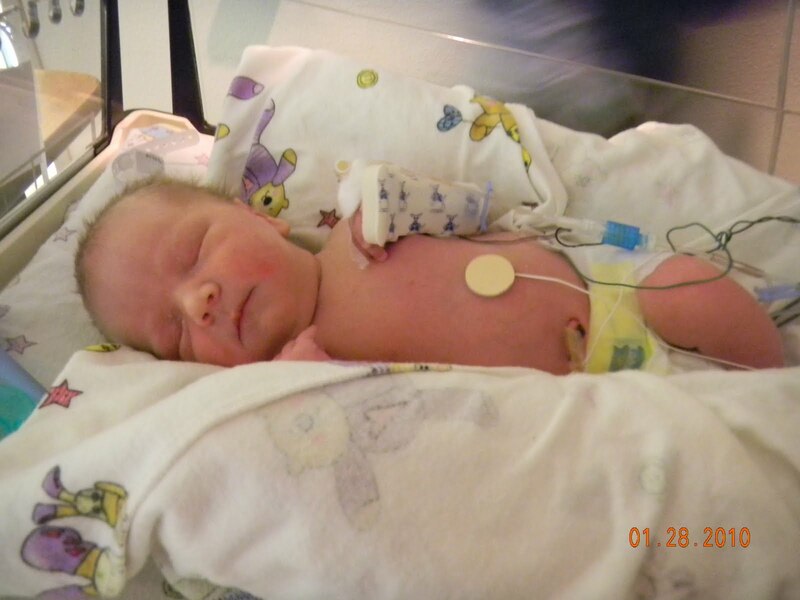 You can’t visit in the NICU unless one of the parents take you in there. So that eliminates most everyone except for grandparents and immediate family. Hopefully tomorrow’s feedings will be better and bring them closer to going home. There is no place like home. 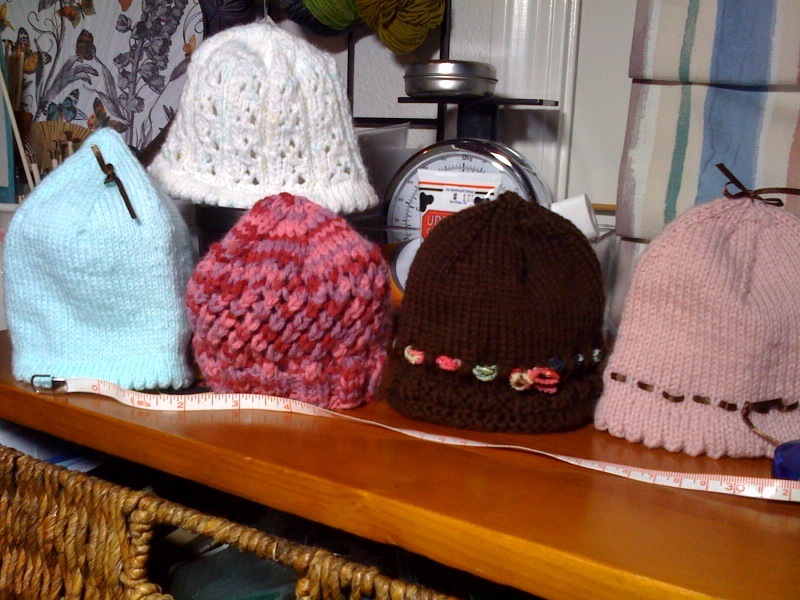 Addison has lots of toppers to keep her head warm once she gets out of the NICU’s warming lamps. There are acutally two more that didn’t get photographed and I have two more on the needles and bunches more in my head. They are fast, fun, and a bit more addictive than socks. Those of you with the sock bug know what I mean. These go way faster. And I now have two hats on the needles, one lace, one a knit-in-the-dark hat. 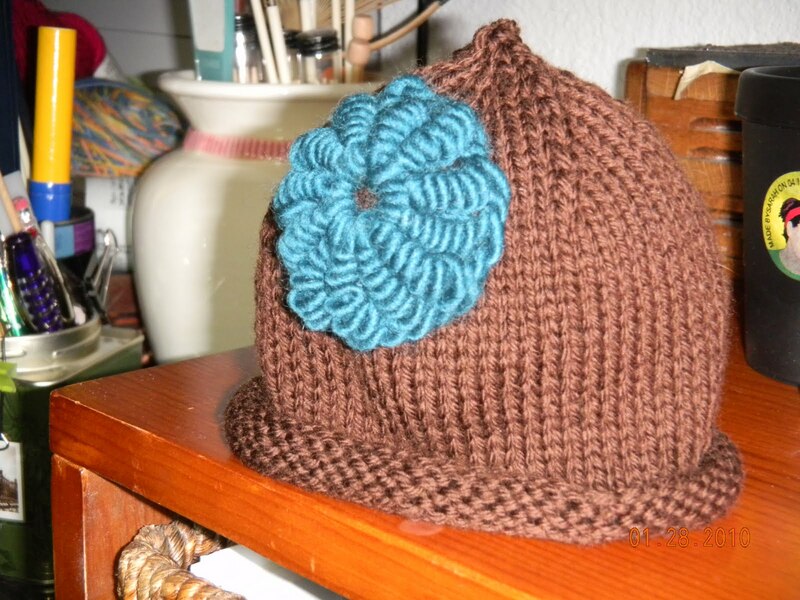 Two hats for two different knitting environment/mind spaces. How about knitting on Sunday, Anyone up for it? At the usual place, usual time! Hey, I found a pattern for a baby hat that looks like a hershey kiss. Do you want that one?